Guillermo Del Toro has a decent track record with producing films from lesser known/up and coming talents. 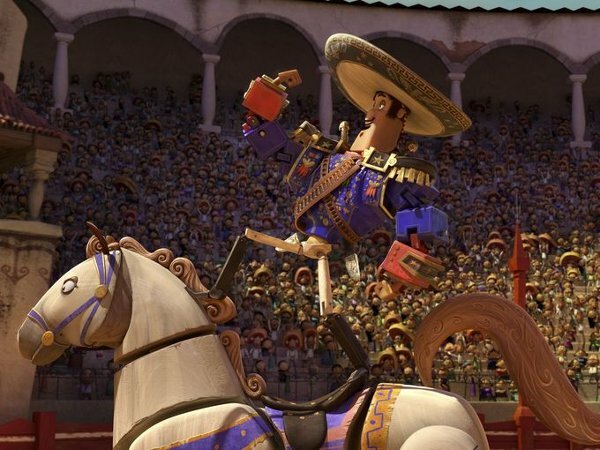 His most recent effort is the 20th Century Fox animated film The Book Of Life. Drawing inspiration from the Mexican holiday of Dia De Los Muertos, also known as "the Day of The Dead," the film looks to be a colorful exploration of friends, family, and the wages of the gods. Excitingly enough, we now have our first look at the visuals we should expect from this new cartoon, with some pretty big names behind the voices. 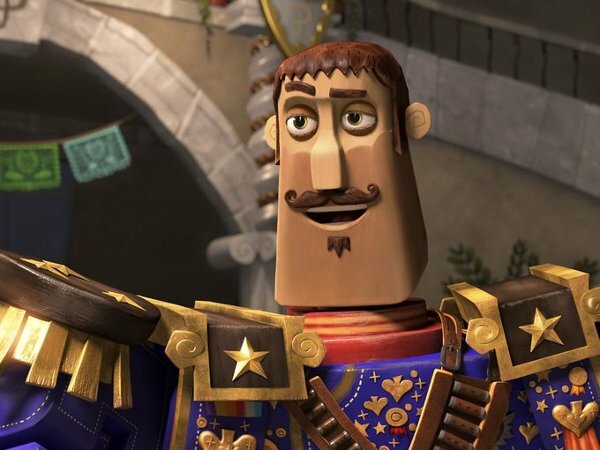 USA Today had the honors of launching the first stills of the 3D animated film starring Diego Luna, Zoe Saldana, and Channing Tatum. The trio play Manolo, Maria, and Joaquin – respectively – a trio of best friends who become ensnared in a love triangle spurred on by a wager of the gods. Manolo, the focus of our story, also wants to be a guitar player instead of following his father and grandfather's footsteps into the family tradition of bullfighting. To seek the answers to the questions his life has inexorably posed to him, he must travel into the Land of the Remembered, where he will meet with gods and ghosts of family members passed. The first still is of Manolo and Maria, the pair the movie will obviously have us rooting for. Interesting fact, this isn't the first time Diego Luna and Zoe Saldana have fallen in love on camera. Those of you with good memories will remember that the pair played amorous airport employees in Steven Spielberg's The Terminal. There's more than a simple hunch that these two will end up together, but considering Guillermo Del Toro is the film's producer and a key component to getting this film made, it might be a little too early to write this off as a simple happily ever after. In this next still, we see Manolo serenading Maria on her balcony, which begs the question – can Diego Luna sing? 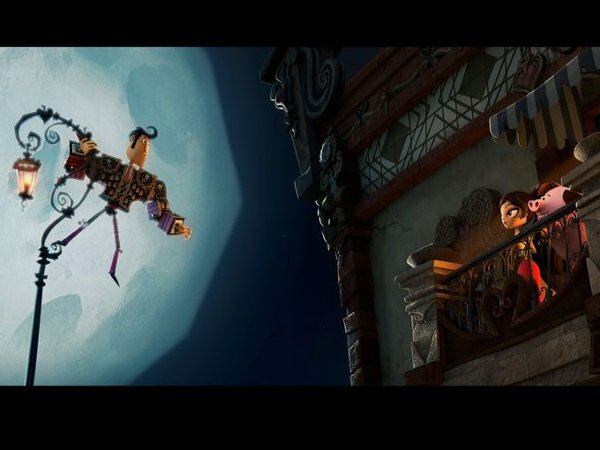 According to director Jorge Gutierrez, not only did Luna tell him he could sing, he took special classes to sing in the style that The Book Of Life required of him. Another fun fact about this still is that it looks almost exactly like the concept art of the same frame we saw a while back. Sometimes you just have to love computer animation! It goes to a place of sour grapes and deep hurt to the point of losing their friendship. But friendship always wins. That's the message of this story: love and friendship and what you're willing to sacrifice for these ideas." Another fun fact that shows Channing Tatum's dedication to his role is the fact that he fought for a bigger mustache on his character. The one you see in the finished product below is a compromise between him and the filmmakers, and it's going to be a major source of pride for Joaquin throughout The Book Of Life. It's great to see Fox breaking out of its typical Blue Sky animation mold of Ice Age sequels no one asked for, in order to produce such an original project that just happens to have one of the most creative minds backing its play. The Book Of Life opens on October 17th, in time for the film to be enjoyed during the actual Day of the Dead festival on November 2nd.